Peeps come in bright pretty Easter colors. They are great for making treats and favors for kids birthday parties. Use sprinkles to match your party theme. We found this cute idea from Love From the Oven and had to try some too! They are cute and easy to make. You can decorate bunnies, ducks, any color or theme. Experiment with different sprinkles to match the color theme or your party. Perfect for any Easter party or if you are celebrating a birthday around this time of year. 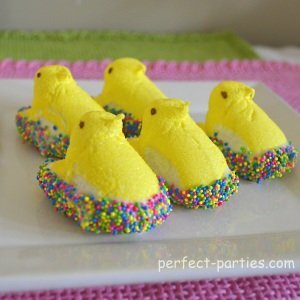 If you have other Easter treat ideas, please share yours! Use a chocolate melter if you have one or you can melt chocolate in microwave safe container. Since microwaves vary, you will have to adjust the time to your microwave. Start with 30 seconds, stir well with wooden spoon, add 15 seconds as needed. Heat until just melted. Chocolate should be warm not hot. Chocolate scorches very easily and will taste burnt if heated too long. While chocolate is melting, separate ducks carefully. They will reform as they sit there if you smash them while separating. Pour sprinkles into shallow dish. Spoon, brush or dip peep into chocolate until the bottom is covered. If you use a spoon or brush you don't have to have chocolate on the bottom. If chocolate starts to thicken, add a teaspoon of Crisco or shortening to the chocolate and mix thouroughly. Place duck into sprinkles and rotate so all sides are covered by sprinkles where ever there is chocolate. We liked using a silicont brush for a smooth edge and minimal chocolate on the bottom of the duck. We found the sprinkles and treats at WalMart. Bag a few in a clear cello bag and tie with Easter colored ribbons for a cute party favor.